Drive the streets of Houston’s poorest areas and you’ll see them: skinny, stray dogs that are hungry, unloved and unwanted. A few lucky ones will be rescued and eventually find a home. Many will not be so lucky and, since they are not spayed or neutered, will produce litters of puppies who will also be strays. Thanks to the Big Plates For Big Fix Houston fundraiser, Houstonians have a chance to help the problem in one of the easiest ways: by simply dining out at participating restaurants. Bernie’s Burger Bus: Buy a Detention Burger and generate a $3 donation to Big Fix Houston. You might want to bring a friend to share, too, as the Detention Burger is an $18 mammoth that uses two bacon grilled cheese sandwiches as buns. Inside are two cheddar-stuffed cheeseburger patties, “tipsy” onions, pickles, shredded lettuce and slow-roasted garlic tomatoes. Cuchara: Order the special margarita of the day and Cuchara will donate $2 for each one to Big Fix Houston. If you needed an excuse to order a second one, there you go. You’re welcome. For dinner, order the Huarache Con Tasajo for dinner, a thin beef filet strip over a huarache corn cake with sides of refried beans, guacamole and poblano peppers with onions, cream and cheese. You’ll generate a $5 donation for Big Fix Houston. In addition, at brunch Cuchara is contributing $3 from the sale of an entrée named “Her Majesty, Pambazo.” It’s bread fried in guajillo pepper, stuffed with potato, chorizo, refried beans, lettuce, cheese and cream, then topped with spicy green salsa. Giacomo’s Cibo e Vino: Chef-owner Lynette Hawkins, a former dog rescuer herself, is contributing to the cause. 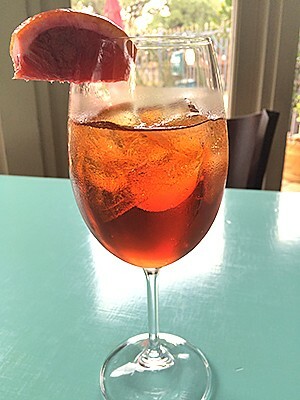 Giacomo’s will donate $2 for each specialty Negroni Sbagliato. (That’s Italian for “Negroni mistake” as the traditional version of the drink uses prosecco instead of gin. Hawkins substitutes Cappelletti for Campari as well.) The restaurant is also donating $5 for every brunch entrée and $7 from every dinner order of Linguine Giacomo ($5 at other meal times). The pasta is dressed in a sauce of sundried tomato, almond pesto, extra virgin olive oil, then sautéed shrimp, cherry tomatoes, peppery arugula, a bit of white wine and lemon juice are added for bright flavor. There is also a fundraising party on Thursday, January 26, from 6:30 to 9 p.m. at McIntyre’s (1235 West 19th). A $10 donation to Big Fix Houstoo scores two drink tickets. There will be a $15 wine pull and silent auction as well. Big Fix Houston is collecting collars at the event to give pet owners during the volunteer outreach effort. Valet parking is available. Big Fix Houston is an initiative, led by Unity for a Solution with support from the City of Houston, that will send volunteers on February 11 to ten of the worst areas for strays. They will provide residents with vouchers to get free vaccinations, spays or neuters and microchips for pets, as well as explain why these measures are necessary. Contact or stay up-to-date on Big Fix Houston’s efforts via Facebook, Instagram, Twitter or email. Restaurants interested in helping raise funds should get in touch with volunteer Lauren Postler.